Getting outdoors to enjoy nature sometimes involves fascinating encounters with wildlife. 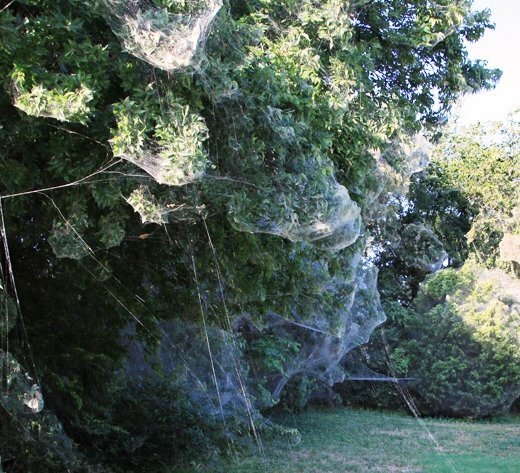 But for residents of a town in Texas, the enormity of a spider colony there is a bit much to handle. In Rowlett, Texas, a single web one quarter mile wide all but covers a town park. Some are terrified. Others are amazed. While some wring their hands and consider whether or not the event marks the rise of arachnids or even the work of one giant spider, experts say the web is actually a naturally occurring phenomenon caused by the gathering of members of one specific family of spiders, the long-jawed Tetragnathidae. The web stretches from tree to tree and is filled with what amounts to a museum of captured insects. Visitors occasionally spot one of the web’s architects scuttle across their creations, perhaps looking for more food. Experts with the Texas A&M AgriLife Extension Service say the spiders pose no threat to passing humans. Instead, long-jawed spiders actually work together to build communal webs. While they are not generally so large, at least one other park has been covered in a giant spider web in recent history. In 2007, Lake Tawakoni State Park, about only 30 miles away from Rowlett, was also taken over by an army of spiders. Those spiders were determined to be long-jawed orbweavers, and although the spiders at Rowlett have not yet been conclusively identified, experts say it is likely a similar species.